Are you making any of these costly mistakes with your dog? So many of my clients come to me with serious dog behavior and health issues, I decided to write a book on all the most common mistakes people make with their dogs. I want to help you have happy, healthy dogs, and to do that, you need to get dog savvy. Because most of the problems people have with their dogs come from these 12 most common – and very costly – mistakes. Once you know what they are, you can easily avoid making them, and save you and your dog a whole lot of heartache. Does your furrkid ever embarrass you, make you sad or frustrate you? I hope you are ready to learn how to improve your dog’s health, well-being and sanity, because I’ve got some really great stuff to share with you that you can start using right away. Whose fault is it when dogs disobey? Most of the mistakes I work to correct stem from mismanagement and misunderstandings that can be easily avoided, once you know what to look for. Did you ever see a ‘telegram’ from your dog? They’re sending out SOS signals every day when they’re in distress, feeling blue, are in pain or have something they need to tell you. There’s no reason for you or your dog to suffer simply because you didn’t know what you don’t know, right? Dog Parents Make – Learn how to have happy, healthy dogs. So much can go wrong in every puppies life, from not taking advantage of the opportunities to show your dog how to behave, to learning how to have good self esteem and confidence, to know what to do in different situations, and to know how to relax. There is a critical window in every dog’s life and development stages when they are most needing to learn important, safe, confidence building concepts in order to grow up to be healthy happy dogs. If you missed the window, or, if you are in that window now with your K9 pal, be certain that you fulfill their needs in the right way. Extremely Valuable Book Packed With Great Advice – for Dogs AND PeopleI found this an extremely valuable book filled with more information than I had imagined! Such a short book packed full of incredibly helpful and beneficial advice. If more people read this book before acquiring a new dog and following Val’s wise advice, there would be many less dogs turned into shelters and more peaceful homes for both the dogs and their people. I highly recommend reading this book for anyone who is having challenges with their dog friends. She offers sound advice, often simple to implement when you are dedicated to transforming your relationship with your dog and earning their respect, while also having a devoted and loving friend for the rest of your life! She also includes many valuable resources as well. Morgine Jurdan, animal communicator, writer, coach, artist. Full of Good Sense and Treasure – Unputdownable! Immensely Enjoyable, A Treasure Trove of Great Advice! Read This If Your Best Friend Is a Dog! I Wish I Had Found This Excellent Book Sooner! Properly socialized dogs are healthier in body, mind and spirit. And they grow up to be the best canine companions you could ever imagine… if you do your work right. Is the life of your dog worth $20? This important book and teleclass series teaches you what you need to know to get it right. Click Here to claim your copy of How to Avoid the Top 12 Costly Mistakes Dog Parent Make – Learn how to have a happy, healthy dog! Retail $19.99 — your’s today at the Pre-Launch Price of only $19.99! Val’s Advice, Tips and References are Worth Their Weight in Gold! Val draws upon her years of experience helping animals and their human companions to provide an easy to follow guide that everyone should follow if they have a canine companion. Her approach, tips and references are worth their weight in gold! Not Just Another Dog Training Book – This Is One Of The BEST! I Got My Puppy Family And Household Back Under Control! Making It Easy To Understand And Guide Your Dog Humanely! Finally a book for pet owners to pin point and address their four legged friends issues, and overcome them once and for all, in a humane fashion! This book also gives the prospective pet owner an easy to understand guide so they may avoid bad behavior from the start! If you are a pet owner you need this book! 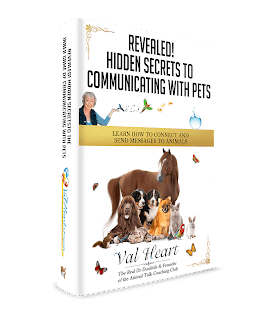 Val Heart is an expert animal communicator, and she knows just how to address behavioral issues in a manner everyone can understand. Thank you Val for this amazing book, well done! Bonnie Best, Author of The Real Poop Scoop on Pet Sitting and Create Financial Freedom Playing with Pets! A 86 year old neighbor of mine lost her dog recently. Trixie was a typical senior dog: quiet, wise, serene. After 14 years, Trixie passed quietly away. My neighbor then decided to get a new dog to fill the void in her life. The new dog, Ruby, 6 months old, knew only one speed – all out RUN! She was happy, completely uncontrolled and impetuous. One day, the front door opened and lickety split, off Ruby ran into the street. Yelling, my neighbor rushed after her. A few minutes later, she was on the grass with the ambulance and fire truck on their way. She had fractured her leg in four places. Ouch! I went straight to Val Heart’s website to buy my neighbor a copy of this wonderful book because clearly, my neighbor had made the most classic, fundamental of mistake of all (it’s #1 in the book). She got the Wrong Dog for Her Lifestyle. No Risk Guarantee: Every penny you invest in this valuable program is safely backed by my reliable, 100% no quibble guarantee. But if for some reason this program doesn’t live up to your expectations, simply tell me within 30 days and I’ll refund your purchase out of my own pocket. You have my word on it. Just try the program, follow the instructions, and let me know what happened. I believe you’ll get SO much out of it that you’ll never look at your animals the same way again, and that you will be delighted with your experience. I’m that confident.